Beyond simply providing access to people with physical disabilities, Universal Design envisions solutions that accommodate as many people as possible. Find out more about how you can incorporate Universal Design principles into your playspace. Who are the people in your neighborhood? Nearly one out of every five people has a disability (U.S. Census, 2002). Is your playspace a place that welcomes people with special needs? Are you thinking beyond wheelchairs? Learn how to make your playspace as welcoming as possible to every person in your neighborhood! 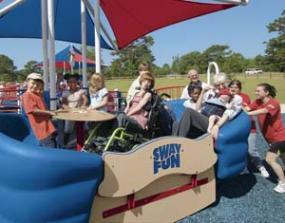 Read more about accessible playspaces from California to Copenhagen. Surfacing is the first step toward a fully accessible playground. Consider a material's safety, maintenance, accessibility, and cost before making a choice. Learn more. Children of all ages and abilities explore the world and learn about their environments through sensory input. With thoughtful design, your playspace can engage and develop every child's seven senses. Read about how to plan a sensory rich playspace. Children with autism spectrum and other sensory integration disorders might struggle with the increased levels of sensory stimulation at a playspace. With certain considerations, however, children with these disorders can enjoy your playspace and even thrive there. Learn more. Resting, thinking, and just staring into space are important parts of a child's day. If quiet spaces and activities are a part of your playspace, children will naturally seek these out to calm down and participate in quiet play. Read more. Content developed by Mara Kaplan.